So thankful to feature this guest post by Jenn Larson from The Teacher Next Door. The research on adding movement in the classroom is clear. Not only does movement increase student learning, enhances concentration, boosts on-task behavior, and improves student attitudes, but it also decreases stress levels, while increasing happiness levels. Kind of makes you want to start moving yourself, doesn’t it? So, what can we do as teachers to make sure that kids get the movement that they need? Here are three things you can do to get your kids moving each day. I learned a long time ago that kids are much more engaged when they are actively involved. Movement is a perfect way to do this and can be used in a variety of ways. For example, when teaching a government lesson on the local, state, and federal levels of government (not exactly a fascinating subject) I list an example and the kids make their arms into an L, S, or F to answer. Or when doing a punctuation review lesson, kids can clap for a period, stomp for a question mark and stand up and make a “pop” noise for an exclamation point. Another example is to label the corners of your classroom with the letters A, B, C, and D. Ask the kids a content question or an opinion question and then they move to the corresponding corner to show you their answer. Finally, adding role-playing whenever possible is not only a great way to increase learning, but the kids love doing this. I especially love using role play during social studies lessons. To me, reading the lesson together straight from the book is the kiss of death. So, we make it into a play and get everyone involved. We role play King George and the Revolutionary War, the Discovery of Gold and more. Fun stuff! I love using cooperative learning groups in my classroom. One thing we do is to match kids into random partners or small groups daily. Using Popsicle sticks, puzzle pieces, cards, and more will get the kids up and moving to find their partners. In addition, there are several cooperative group strategies that work well to add movement. One is called the Share and Switch. After kids have created a poem, a paragraph, or have something to share, they walk around the room until I call out “Stop and share.” Then they share until I say, “Time to switch,” which is their cue to start walking again. Another strategy is to do a “Double Circle.” I have half of the kids sit at desks in a circle and the other half make an outer circle. When I say “go,” the kids share out with the person in front of them. After a few minutes, I tell the outer circle to “Move two spaces,” or “Move four spaces,” and they move clockwise to share with the next partner. It’s a great way for lots of sharing to take place, with the added benefit of movement. Brain breaks have become increasingly important, as recess and P.E. have decreased in some places due to high stakes testing. Regardless of whether kids have recess time or not, they all benefit from frequent movement to energize their brains and to help them focus for longer periods. The important thing about brain breaks is that kids are actually moving and are able to get out of their seats to increase the oxygen and blood flow to their brains. I created a set of 100 task cards with over 250 brain breaks as an easy way to help teachers incorporate brain breaks into their day. Another great thing to use is the website Go Noodle. It has hundreds of really cute songs that kids can move and groove to, and the best thing is that it’s free! Movement is one of the critical pieces involved in effective learning, is simple to add, and yet it has so many benefits. Anyone who has observed children knows that kids were born to move but by incorporating purposeful movement throughout the day, distracting movements decrease, and kids are able to better focus. 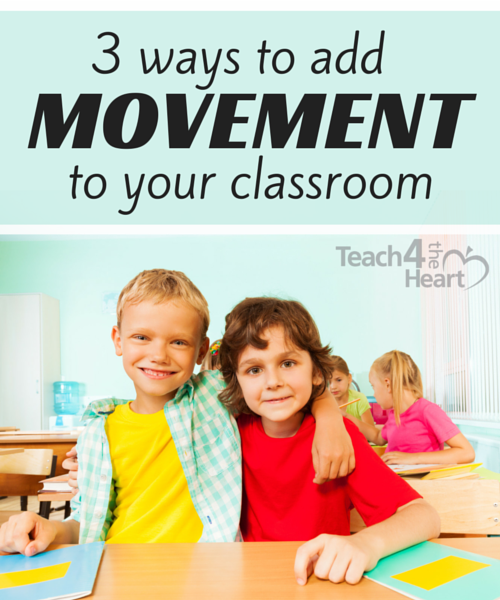 How do you keep kids moving & engaged in your classroom? Jenn Larson has been a teacher for 20 years and has taught every grade (K – 5) at least once! Jenn is a curriculum designer at Teachers Pay Teachers. Jenn has two children and lives in Northern California. In her spare time, she loves to travel. Get ideas from her website and blog. For the latest in educational resources and curriculum products click here. Connect with Jenn on Facebook , Pinterest, and Instagram. Thank you for such a great article. I teach 4 yr-old preschool and this year I am having great difficulty getting the children to listen. The class is made up of 7 boys and 5 girls. Needless to say, but the boys are vying for the “alpha” position with their peer group. I am searching daily for ideas to help me get control of my classroom while enabling my students to learn as a 4 year old should. I plan to use some of your suggestions to help me. I teach 3s and we’re known to do yoga poses that tie into our theme. We practice counting my jumping, marching, spinning, etc. X number of times. I also do a lot of letter or color hunts where they have to go find post it notes with a letter or number on it that I have “hidden.” Last year my class loved having paper snowball fights! I believe wholeheartedly in active learning and can’t expect a 3 year old to sit in a chair and stay engaged for more than about 30 seconds!